The wild beans are var. aborigineus (Burkart) Baudet (1977) [synonym: subsp. aborigineus Burkart (1953)]. A workable infraspecific classification of cultivated beans is quite impossible, as different points of view lead to different criteria. For the gardener, it is important to distinguish bush beans, which were called var. nanus (Juslen.) Aschers. (1864) by botanists, and climbing beans, which were called var. vulgaris [synonym : var. communis Aschers. (1864)]. Climbing beans need to build trellises ot be grown. In fact, specialists recognize up to five classes. Climbing beans have many nodes and long internodes, whereas bush beans have short internodes; bush beans are determinate if they have few nodes, and indeterminate if they have many nodes. For consumers, an essential distinction is whether the product is a seed or a young pod. 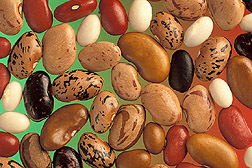 Seeds may be dry (dry beans), fresh (shell beans) or semi-fresh (flageolets). Their form may be kidney-shaped, oblong or quite round. Pods eaten as young pods may be green, purple or yellow (wax beans). Their section may be round or flat. A particular type, endemic of the Andes is pop bean, which explodes when grilled like pop corn. See the description of common beans by Vilmorin-Andrieux (Les plantes potagères, 1904) (in French), with 51 line drawings. See the 49 unpublished colour plates of Le Berryais (1806) and the text (in French) of his Traité des jardins (1785). Popping beans, or ñuñas as they are called in Peru, belong to an indeterminately growing varietal group of common beans, whose seeds expand upon toasting. They are a popular snack in parts of Peru and Ecuador, but little known outside their very limited “insular” distribution. Vilmorin-Andrieux, Les plantes potagères, 1891: 1. Haricot de Bagnolet; 2. Haricot blanc géant sans parchemin; 3. Haricot d'Alger, (beurre) noir nain; 4. Haricot d'Alger, noir à rames, haricot beurre noir. This is the only Phaseolus species which has reached a global distribution. Until the end of the 19th century, botanists believed that the common bean had been known in the Old World since Antiquity. The main reason for that is that Phaseolus beans were given the names of other pulses previously known in Europe (Vigna unguiculata, Vicia faba, Pisum sativum). Moreover, older botanists preferred commenting old authors (Theophrastus, Pliny, Dioscorides...) rather than observing real plants, and it has to be added that Vigna species were badly known and classified in Phaseolus at that time. In 1882, the landmark book of Alphonse de Candolle, L'origine des plantes cultivées, is published, and he inclines to conclude about an American origin of Phaseolus vulgaris. Further commentaries by Asa Gray et Trumbull (1883) confirm it, as well as Wittmack (1888). But Gibault sparked things off in 1896 by insisting on an origin in the Old World. He is immediately contradicted by Bonnet (1897) and Wittmack (1897). Gibault then recognises his error, which results in a correct text in his famous Histoire des légumes (1912). This controversy is now obsolete (although some popular and hurried authors repeat the error from time to time), and has to do with history of sciences. But the texts then published mobilise an impressive quantity of quotations of older authors (botanists, travellers...), which are useful to revisit. This is why we make them available anew. Gibault Georges, 1912. Histoire des légumes. Paris, Lib. Horticole. VIII-404 p., fig. Körnicke Friedrich A., 1885. Zur Geschichte der Gartenbohne. Verhandlungen des Naturhistorischen Vereins der preußischen Rheinlande und Westphalens, 4e series, 11: 136-153. Wittmack L., 1888. Die Heimath der Bohnen und der Kürbisse. Berichte der deutschen Bot. Gesellschaft, 6: 374-380. Wittmack L., 1897. De l'origine du haricot commun (Phaseolus vulgaris). Journal de la Société nationale d'horticulture de France, 155-165. (with comments by Gibault recognising his error). It is now considered that Vigna unguiculata is one of the principal species confused with Phaseolus vulgaris before 1492. But what do we know about its distribution in cultivation before 1492? My hypothesis is that it was quite unknown in northern Europe, and known only as a minor crop in southern Europe. It is basically a species with tropical affinities. seeds, dry or fresh, are by far the most widespread use. young pods (French beans) are also an important use. Sword bean slicer, used in the Netherlands and Germany. Two beans are insertd at a time. Debouck, D. G. et al., 1993. Genetic diversity and ecological distribution of Phaseolus vulgaris (Fabaceae) in northwestern South America. Econ. Bot., 47:408–423. Freytag, G. F. & D. G. Debouck, 2002. Taxonomy, distribution, and ecology of the genus Phaseolus (Leguminosae-Papilionoideae) in North America, Mexico and Central America. Sida, Bot. Misc., 23:36–42. Jacobsohn Antoine (éd. ), 2010. Du fayot au mangetout : l’histoire du haricot sans en perdre le fil. En collaboration avec Gilles Debarle et Kamel Elias. Rodez, Éditions du Rouergue, 160 p.
Neveu Jean-Louis, 2002. Le haricot, la mojhéte & le fayot. La Crèche (79), Geste Editions. 56 p. (Petite encyclopédie des savoirs populaires). This page was last modified on 11 August 2016, at 03:27.